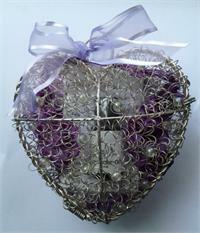 Heart Keepsake ~ Drops® Lavender Oil, 1/2 oz. 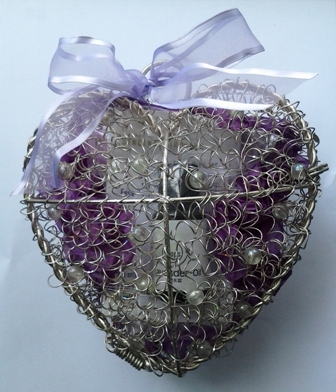 This beautiful heart keepsake makes a wonderful presentation for your gift of Drops® Lavender Oil. The heart is actually a locket opening to reveal the Drops® Lavender Oil. Inside this locket you will find a uses of essential oil pamphlet, one 1/2 oz. bottle of Drops® Lavender Oil along with the instructional information card; a thoughtful gift for the one you love. Put a couple drops of the Drops® Lavender Oil on your pillow at night and enjoy a good nights sleep, put a couple drops in your bath for a Luxurious and Relaxing Bathing Experience! Keep Drops® Lavender Oil in your first aid kit, a must for every home. Great for bruises, burns, insomnia, it’s calming! Can be used neat as an antiseptic. Relieves stress and tension headaches and more! Contains 100% Pure Lavender Essential Oil. If you are sending this as a gift please make a separate order for each shipping address!